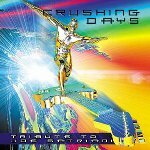 "CRUSHING DAYS A TRIBUTE TO JOE SATRIANI"
The eighties was a good time for hard rock and instrumental guitar music. Satriani's debut album "Not Of This Earth" introduced fans to a new player who had something personal to say with his music. His second album "Surfing With The Alien" was one of the first instrumental releases to receive big time commercial chart exposure, thus elevating Satriani to major success. "Surfing" would be an album along with Steve Vai's "Passion And Warfare" that any future guitar albums would have to level up to. Even the genius that is Edward Van Halen failed to live up to expectation on 1991's haphazard "For Unlawful Carnal Knowledge", of which has seen Van Halen decline in technique ever since, let's face it what has this man actually done in the last 15 years except stick to what he's best know for? H hasn't really developed his style further has he. Anyway Satch has always given us quality albums, and with each album he tries something new and experimental so it's with honour that musicians have gathered together to pay respect to this wonderful axe man who has rarely being bettered since. Musicians featured throughout the album are Candadian star Slav Simanic (one of the best players around today), David Martone, Halford's Mike Chlasciak, the amazing and underrated Ron Thal, Steve Booke, Joboj, The Magic Elf's Carl Roa and the magical Terry Syrek amongst others, all doing their bit to pay homage to Satch with unforgettable songs such as 'Crushing Day' 'Satch Boogie', 'Driving At Night', 'Always With Me Always With You', 'Ice 9', 'Hordes Of Locusts' and 'New Day' A good release, I'd like to have seen the musicians add more of their own identities to the songs like what Terry Syrek has done with 'New Day', instead of recording exact identical replicas, thus would have made for a more compelling release anyway if your a Satch fan, you'll love this, a perfect homage none the less.